Sophomore Grace Roane discusses the final steps of her project with a fellow IB classmate. Roane worked with the Prince George Animal Shelter to raise understanding of the county's stray pet population. Photo by Lisa Parker. The MYP class of 2021 has finally finished their Personal Projects and can breathe a sigh of relief. The MYP or IB program is a challenging program with framework that encourages students to make practical connections between their studies and the real world. MYP is a five-year program that started with 50 students in the 6th grade. They are now in the 10th grade and down to a close-knit group of 28. Sophomore student Skyler Civarella has been in IB since the beginning and has seen many friends come and go. “I’ll remember all the memories with the other classmates because we have become one big family,” Civarella said. While there are many in and out of the IB program who oppose the structure of being with the same students for every class, Civarella sees the positive benefits the program reaps. “I would recommend IB … it’s definitely something to do if you would like a challenge in school,” Civarella said. Sophomore Alexandra Moore is glad for the things MYP has given her. “I’ve made a lot of new friends through IB that I will have for a long time,” Moore said. Moore has also been in the program from the start and it has helped her to grow as a person, and become more outgoing. Sophomore Austin Smyth is one of two students who did not start IB in the 6th grade. Coming into the program a year later, Smyth was quickly accepted into the IB Family and feels a strong sense of togetherness. “My favorite part of IB is definitely the togetherness of everybody, and getting to really interact and get to know your classmates better. We’re a close knit community and I believe I have created better relationships with people than I would have if I wasn’t in IB,” Smyth said. All of the students agree that the program is only for those who are willing to work hard and do the work. 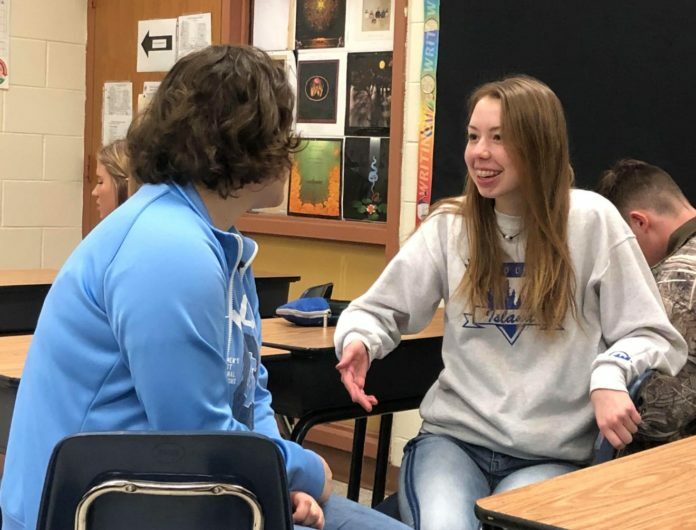 “I would recommend IB because even though people think the program is really hard and they can’t do it, but it’s not as bad as people make it sound and you really will enjoy it,” sophomore Kaitlyn Barker said. All of the IB students agree that the most important thing to do when choosing your Personal Project is to pick something you are truly passionate about because you will be spending the next 5 months working on it. “Don’t procrastinate and make sure to do something you love because you’re going to be working on it for a really long time,” Smyth said. While none of the projects were the same, each one reflected the person who did them, and the values that are important to them. Civarella biked the Virginia Capital Trail, 51.2 miles, in a single day. Moore designed an adoption event with a local shelter to raise awareness on the importance of adopting animals, not just buying from breeders. Smyth created a carbon fiber phone case. Barker made 15 quilts for the Children’s Hospital in Richmond. Sophomore Grace Roane hosted a food and supply drive for the animal shelter, and volunteered several hours of her time at the shelter interacting with the animals. To all of the rising 9th graders who will be starting their Personal Projects next year, everyone agrees the single most important thing is to not procrastinate. Start your project as soon as possible, and make sure it is something you love.